"Confessions of a Long-Distance sailor"
In Darwin, I decided to haul and paint my boat, as it had collected a few scars since Hawaii. This took about four days, after which I joined Bob and Ursula and other friends in an enclosed marina with a lock. And why do they have a marina with a lock in Darwin? Because the tidal range is about 21 feet, that's why. Before I got into the protected area I set anchor in 22 feet of water and rowed my hard dinghy ashore. I had some idea that there were tides here, so I carried an extra-long painter and the dinghy anchor. I threw the anchor out to hold the dinghy off the dock so it wouldn't get trapped underneath in a rising tide, then I climbed about two feet to the dock. When I got back I momentarily thought someone had grabbed my dinghy, but who takes a silly little rowing dinghy? Then I got to the edge of the dock — and saw the tide had gone out. Way out. My dinghy was a little oblong dot far, far below. Another dinghy was hanging in the air, its line too short for the tide. I climbed down the ladder and cast off, thinking how lucky that I brought long lines. Then I began to worry about the big boat. If the tide changed that much, maybe I didn't have any more water under my boat. I rushed on board — and found just one foot of water beneath my keel. This takes some getting used to after Tahiti's six inch tides. I was able to find a seat post for my mountain bike — I hadn't had the use of it since Bora Bora. The bike turned out to be very useful in Darwin, since a key boat-shopping area was too far to walk in the heat. Also I replaced one of my two computers, the Toshiba 1100. It turned out to be so out-of-date they couldn't repair its memory. The new machine is nice, much faster, a better display. Bob, Ursula and I visited Kakadu National Park for two days. We saw lots of crocodiles and some spectacular views. 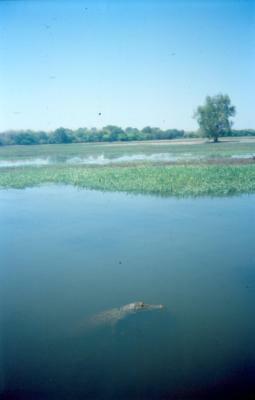 We swam in a pond regarded by local people as safe — "just one croc." After we left the pond, I was told someone dove straight into the croc's domain — and the croc made a sudden, threatening appearance, discouraging any repetition of this behavior. Some things about Australia come to mind again and again. 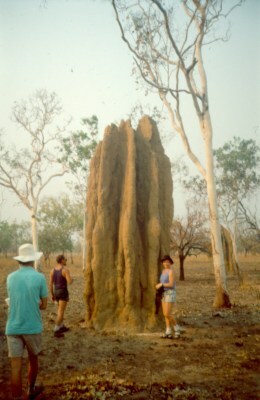 The dry, wild landscape East of Darwin. Anthills twenty feet high. A pack of dingoes working over a road-killed animal in the sunset. A bird that woke me up in the bush by singing a complete melody, as if it knew something about human music. And a group of aboriginal women walking along a road in Darwin, adrift in the twentieth century, each wearing light pastel-colored dresses — yellow, robin's egg blue, light green — they looked like refugees from a war they lost, and perhaps that is literally true. It was a very confusing moment for me. I thought they looked terrible in those particular colors, as if they were advertising how out-of-place they were — but since white men destroyed Aboriginal culture, how can we deny their effort to live in ours? As I pedaled past on my bike, I recalled some of the facts about Aboriginals' lives in modern Australia. Even if dressed in perfect colors they would be denied access to their ancestral lands, they would still drink themselves to incoherence, and they would still die young. Modern European culture is something that is inflicted on them. So the impossibility of their dress reflected the impossibility of their lives. Which meant the colors were, in their own way, perfect — because you couldn't see them pass by and still believe Aboriginals are happy and content. Anyway, after about three weeks of restaurants, movies, and repairs, on October First Take Two, African Queen and I decided it was time to go. We had heard more disturbing radio reports from boats sailing near the Indonesian coast — accounts of being shadowed by mysterious craft, possibly pirates. We decided to continue sailing as a group, within sight of one another. There wasn't much wind early in the day so I motored for a while. Then in the afternoon there was enough wind for a close haul. I put up all my canvas — full main, full genoa, in a 12 knot breeze. I noticed I was doing four knots only 40 degrees off the wind. That's good performance for my boat, and I was thinking it's because I tightened the rigging, especially the headstay. Just then the headstay broke — bam! So I had to bid my friends farewell and turn around — I was only half a day out from Darwin. It took six days to acquire and install the replacement rigging. I decided to replace the entire rig, a good decision as it turned out — the backstay was frayed and close to giving way. These things delayed my departure to October 6, yesterday. There's almost no wind out here — I've been motoring much of the time. Take Two is about 500 miles farther West, and there's no wind there either. They have used up most of their fuel, so when the wind quits they drift and wait. The regional weather charts show a stretch of about 600 miles in which the wind is either light or from the West (caused by the land mass of Australia), after which normal trade winds start up. The trick is to get past this dead zone before running out of fuel or supplies. At the moment I am making 2.5 knots in a 5 knot breeze from 60 degrees off the port side. Yesterday I was making 3.5 knots out of a 10 knot wind only 35 degrees off the bow — the new rig has greatly improved this boat's upwind ability. I hope this remains true when I get to the Red Sea, supposedly a long upwind haul against much stronger winds. Yesterday evening the radar flaked out. Fortunately I was able to bring it to life by disassembling it and trying my usual makeshift repairs. If the radar quits for good, I intend to continue, but I will have to sleep in the cockpit and wake myself every 30 minutes or so. A terrible prospect. So this is the beginning of a more difficult kind of passage, one in which sailing cleverness, constant attention to the wind, and careful fuel management will decide the outcome. Today I met the pirates I've been hearing about. No shots were fired, no knives were drawn, but they meant to board Selene, and I stopped them. About 10 AM I saw an odd-looking sailboat about three miles in front of mine. I was sailing close to the wind, as I have been doing so far this crossing. I watched this boat just to be sure we didn't smack each other. After a few minutes I saw we were on a collision path, so I changed course to clear them — then they changed course also, dead on. They were sailing downwind, so they could match any course change I made, so I decided to bear on and see what they were up to. I also loaded my shotgun. The boat's sails were my first clue that it wasn't a European sailboat — they were large bolts of printed silk, cut to match the dimensions of a wooden mast and boom. When there was about 1/2 mile left to go, they stopped their boat in the water and launched a dinghy. Well, I thought, this is classical, except things like this usually happen at night. I decided on a strategy — I would make sure they saw my gun, then if they approached within touching distance of my boat I would fire a warning shot, then if they tried to board I would shoot them. I have heard enough pirate stories to know if they got on board, my chance of staying alive wasn't very good. One person rowed the dinghy the short distance between my boat and theirs. I took up a position on the rail with shotgun in hand, trying to be conspicuous. He wasn't going very fast in his rowing dinghy, but I wasn't going very fast either, maybe 3 1/2 to 4 knots. Just as he reached out to grab my boat and be towed along, he saw the gun and stopped. As he came alongside he smiled and made a sign that I should let him and his friends on board for a drink. I looked beyond him to the sailboat and could see at least four more men on board. I shook my head and waved him away with the gun. He rowed back to his vessel, and after they had secured the dinghy they tried to sail toward me for a while. I found this particularly scary, since they knew I was armed and they were trying to catch me anyway — therefore, I thought, they are also armed and plan to shoot it out. But I was sailing close to the wind and they couldn't match my speed or course, and they soon broke off the pursuit. The critical moment in this episode was when the man in the dinghy reached out to my boat to pull himself along, and I came to the rail and stopped him. We looked across the barrel of my shotgun for a moment, and he realized I'd use it if I had to. I didn't have time to think during this episode — afterward some things occurred to me. One is that I could have been in the cabin reading, as I do for hours at a time, and at least one person would have been on board before I knew. Another is a description I read of typical pirates in these waters — part-time fishermen who raid passing boats. I personally think there is no way I could have kept them off my boat without the shotgun, and the appearance of the gun was pivotally discouraging. Today I think anyone who sails these waters without a gun — and a willingness to use it — is a fool. Today Take Two is about 600 miles away, in an area normally filled with trade winds, but they are still sometimes becalmed. So I am taking this to heart — I have to resist my tendency to fire up the diesel anytime the speed falls below two knots. On the plus side I am seeing performance in this boat I never thought possible — most of it arises from the new, very tight rigging. I can sail just 35 degrees off the wind if the surface isn't too rough, so I am going to patiently sail in lighter winds to save fuel. I'm also going to watch more carefully for boats. Yesterday there was plenty of wind of the kindest sort — nearly abeam, 13 knots, very smooth, four to five knots boat speed. Today there's almost no wind again. Now, at 118 degrees East, I expected to have reached constant wind. But there are some good signs. What wind there is seems more Southerly, a favorable change. I have about half my diesel left. I can motor continuously about 3 more days, or more if the wind blows part of the time, after which I will have to drift and wait for wind. My strategy has been to motor as far West as possible before rationing the fuel, because the strong winds are West of here. Now I have to begin to take greater care with the remaining fuel, since I could sail into a calm anywhere in the 1300 miles left to go. It is very hot here. Light seas, light wind. I see dolphins most evenings playing around my boat. They gather around the bow and, if I take a position there, they swim past and look me over between dives and broaches. In my opinion the combination of an Indian Ocean sunset accompanied by a performance of the dolphin follies easily wipes a storm off the sailing account books. A few days ago, during one of the calms, I dove on my boat and cleaned the propeller (since I have been motoring a lot, I wanted it clean). So I have gotten off the boat while underway, supposedly a no-no for a single hander. I naturally took down all the sails and tied the tiller to one side to keep the boat from sailing away. I spent half my time scrubbing my prop and the other half looking for Jaws. I still talk to Take Two twice a day. In the morning chat I try out my German on them, usually with hilarious results. Rule number 1: you can't just translate English into German word for word, unless you want to hear giggles on the radio. I have a couple of German travel books and a dictionary, but I haven't learned German grammar. I am playing catch-up again. Now I'm catching up to recover the time lost in the return trip to Darwin. The cruising guides say the best time to leave Cocos Keeling is at the end of October, which I will just make. So I expect to spend just a short time there, about five days, then make another long crossing to Sri Lanka. Take Two and I plan to spend a longer time in Sri Lanka, probably a month, the civil war notwithstanding. Some boats in Sri Lanka tell us things seem normal unless you read a newspaper. My shopping is becoming more prescient. On this passage I have enough cookies and sodas, probably for the first time. Staples have never been a problem. I have always had the mental twist required to load three shopping carts with identical cans of chicken soup. But I find it harder to make stacks of potato chips, cookies, sodas, you know, goodies. Things that a sailor's diet mustn't have too much of, or too little. Sleep has been difficult on this crossing, because of frequent changes in the wind. I have taken to setting an alarm that goes off every two hours, and most of those alerts have been useful. Either the boat has stopped dead in the water, or has decided to sail back to Darwin without consulting the captain, or the radar has flaked out from the heat and needs a 30-minute rest. Once I get to normal trade winds (if such a thing exists out here) I expect to recover my usual disposition. Meanwhile I feel sort of beset, under an abnormal amount of stress. Also my voice is nearly gone — it's hard even to talk on the radio. I found the wind. As I began this sail I was in the wind shadow of the continent of Australia, but that's all over. In the last 24 hours I averaged seven knots (!) with some help from a favorable current — that's 168 miles! Now I understand the reports I was getting from Take Two about a week ago (when they were here). It was discouraging at the time — I was making about two knots, mostly motoring, and they were about 100 miles farther away each day. Bob and Ursula have been telling me about Cocos Keeling (where they are anchored now) — it sounds like a fun place, a coral lagoon with a couple of small towns, nice diving. I will only be able to stay a few days before starting for Sri Lanka (still making up for the six extra days in Darwin). After the first ten days I began to like this crossing, in spite of the light-to-no winds and the pirate encounter. I have a good collection of books, having replenished my supply in Darwin by trading and buying. I bought enough treats, there's no way I'll run out of cookies this time. Soon there won't be any electronic gear on the boat that I haven't replaced at least once since I started sailing in '87. The radar flakes out in so many ingenious ways that I would replace it if I could. Even the Kenwood ham radio is showing signs of accelerated decrepitude. My VCR stopped working recently, because a single drop of salt water made its way onto the surface of an important polished cylinder inside. This cylinder spins very fast, carrying along with it two magnetic sensors that pick the video signal off the tape. The drop of water produced a spot of corrosion that kept the cylinder from rotating fast enough. I tried to polish the spot, but nothing worked. Fortunately I acquired a spare VCR while I was in Hawaii, the last location where U.S.-style television equipment was available. In spite of these equipment failures I am beginning to enjoy sailing more and more. In fact I wonder how easy it will be to go back to normal life after this voyage is over. I know one thing — when it's over I am going boat shopping. This boat has the worst interior woodwork I have ever seen in any boat or house. The wood is not durable, and nearly everything is glued together. Where screws were used, they generally didn't reach through one piece of wood to sink into another, so everything looked sound until I entered the tropics, where wood glue is known to give way. Pieces of trim fall daily from their places. When one or two pieces fell off, I used to glue them back into place, but now I chuck them overboard in handfuls of six or eight. The other day a countertop lifted off its mountings. It was another example of screws too short for the job, and a small dab of glue was the only thing holding it in place. I couldn't do without the countertop so I mounted it as it should have been in the first place. Now that I have enough experience to know how to look at a boat, I am going to shop for a better one. I have visited some boats whose interiors were entirely of hardwood, and the quality of work was obvious. This boat really does have a teak interior, which is the stupid question I asked before buying it, but not all teak is created equal. Old-growth teak may be hundreds of years old, and very strong — but that wood is gone. Now they have commercial lots where teak is grown as fast as possible, and has the strength of cardboard. I will probably buy a boat of more conventional design than this one, so I won't always be the last boat to arrive. This boat is heavy enough to be comfortable in perfectly awful weather, but I pay a high price for that the rest of the time. My next boat will have to be bigger also — only because I can't fit enough sails, supplies and toys in this one. Also if I met someone I wanted to sail with, she would have to be completely immune to stressful situations to stand the cramped quarters on this boat. The forward berth is completely full of things I couldn't fit into existing lockers, so there's no private space except out on deck. I would like to have gone shopping just once for a boat and kept it for a lifetime, but I didn't know enough about boats, in spite of all my advance reading. In ten years the interior of this boat will be completely dissolved, through a combination of bad wood and workmanship, and the many leaks at the seam between the hull and cabin moldings. I am going fast! I should reach Cocos Keeling in two days at this pace. Yesterday I averaged 7.1 knots (including the effect of current). The wind is aft of beam on the port side at about 15 - 20 knots relative, an ideal wind. All three sails are up and I've been adjusting the speed with the roller furler. If I have too much sail up, the boat begins to wallow back and forth over about 60 degrees, a very uncomfortable condition and hard on the sails. So I tune the sails every couple of hours for a speed just below the point of discomfort. The sea is getting smoother and my sleep has consequently improved. Plenty of dreams. I've been planning my life after this sail. I'll buy a very fast computer of the latest generation and install a graphics adaptor in it. Then I'll make some more pretty computer graphic images, get invited to graphics conferences, and meet interesting people. This is something I was doing before I started sailing, but the available machines were slow and expensive. Things are changing fast in the computer world — more computing power for less money. I'll buy a better boat, roomier, suitable for more than one person, and sail the San Juans in the summertime — I'll invite friends for week-long outings. I'll stock my camper van with supplies and visit the desert — or if it's wintertime I'll drive to Utah and ski in some of the resorts out that way. These are the immediate plans, ones requiring no great stretch of the mind. Then there are notions like selling my house in Oregon and living full-time on a boat, or buying a country house on high terrain and building a great ham radio station. That's an advantage of sailing — the elements of your life, usually too big to think about clearly, become as manageable as chess pieces, that you move around an imaginary board as you sail and dream. This evening I saw something I've never seen before. I was sitting out in the cockpit, enjoying the stars and the boat's glowing wake, when I noticed some glowing trails in the water. Then I heard surfacing dolphins — and I realized the trails marked their paths through the water! I went forward to the bow to watch the show. As the dolphins swam about, they disturbed the water and set off a glowing display called bioluminescence, just as the whitecaps and the boat itself do. It was pretty and mysterious — for an hour I watched an intricate dance of six to eight dolphins, all seen by way of glowing pathways left behind in the water. 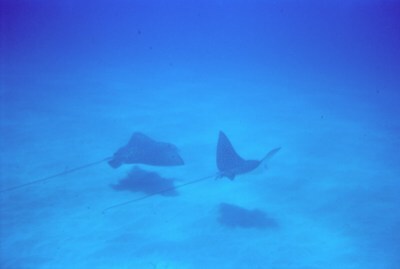 I felt as though I could follow their motions better than in daylight, when they can only be seen near the surface. It was like visiting a spirit world — I didn't actually see any dolphins, I only heard the sound of their breathing, and saw their glowing pathways. Then I wondered how much reliance dolphins themselves place on these glowing wakes, as well as their better-known senses, to make their way through the nighttime sea. How I mailed my letters in Cocos Keeling ... a true story. Our story begins at 5 AM. I get up with some difficulty (unaccustomed to thinking of 5 AM as being part of life as we know it) and have breakfast. I pack my letters and my laundry in a waterproof bag. I decide to wear my foul weather gear, since it's blowing over 20 knots and I will be motoring my dinghy against the wind. I take off in my inflatable dinghy, and make about 100 feet before the engine quits. I fix the engine and take off again. I am anxious that I should get to nearby Home Island on time to catch the ferry to West Island, where the post office and laundry are. During the crossing from the anchorage at Direction Island to Home Island, I discover that all the good-sized waves seem to have my name on them. Each one comes splashing into my dinghy as if invited, and gives me a big, salty kiss. Soon I am drenched under my foul weather gear, and I begin to think I would be more dry if I had worn nothing. As I come into the lee of Home Island, I notice the wind and waves begin to diminish and my speed picks up. I had been warned to stay in the center of the channel while heading for the pier, because of coral all around. So I line myself up between the channel markers and motor on. About halfway in I smack a coral head. My propeller's shear pin rescues my motor by breaking. I am too far out to row, also the wind is still strong, so I throw out my little anchor and repair the propeller. Available for this task are a Swiss Army knife, some extra parts attached to the outboard motor by its clever manufacturer, and a world-class vocabulary of swear words. Fortunately for me, the wind direction prevents my ingenious oaths from being heard by the schoolgirls who by now are boarding the ferry and watching the antics of the nut-case stuck out in the channel (Later I was told that yes, there are some coral heads within the channel, but everybody knows about them and steers around them. Except the first time). I manage to repair the propeller, row away from the coral head, start the outboard and continue in. About 100 feet from the pier I run out of gas. I row the rest of the way. I tie up, throw my drenched possessions ashore, and run for the ferry, which has been waiting. During the ferry ride from Home to West Island I sit outside, sorting through my possessions and trying not to look conspicuous, even though I am thoroughly soaked. I untie my waterproof bag, put the letters in my backpack and repack the laundry, which I set inside away from the spray. When the ferry reaches West Island I jump ashore and start walking to the settlement, about 6 kilometers. About halfway I realize I have left my laundry on the ferry. But by this time I am so taken with the beauty of the place that I have a hard time getting very anxious that my laundry has been abandoned among strangers. I decide I will mail my letters, do some shopping at the market, walk back for the ferry's next appearance, retrieve my laundry, and return to town. A lot of walking, but a lot of beauty. Anyway, I finally got to the post office. I furtively passed my damp letters through the little window into that mysterious outer world. Later I found my laundry just where I left it. I had been told that theft is almost unheard of, and certainly not someone's laundry from a sweaty 20 day sea crossing. There was one very windy day in Cocos Keeling, so I launched my wind surfing board. The reef kept the wave heights down, but nothing stood in the way of the wind, so I went very fast, probably more than 20 knots. It is hard to imagine how I could have gone faster. I would hang from the harness with all my weight, the board moving so fast that it just touched the wave tops, and sometimes the wind would gust a tiny bit harder — and I would be pulled across the board and crash into the water. Quite a ride. This passage has been very difficult — until today I have been too tired or busy to write. There are squalls all around, and they do funny things to the wind (see below). My constant attention is required. I can't just sit in the cabin reading, expecting the boat to carry me automatically to Sri Lanka. I actually have to work for a living out here. Squalls have their own local wind pattern, usually blowing radially outward in all directions from the center of the squall. So if I pass to leeward of a squall, its wind is added to the overall wind. Big gust. If I pass to windward, the two winds sometimes completely cancel each other out. Start motor. If I happen to be aimed right for one, I might find myself trying to run straight up into a 25-knot wind. I began in the Southern trades, moved to the Inter tropical Convergence Zone where there was almost no wind, and am now at 3 degrees South, in the Northern hemisphere's wind domain if not actually in the Northern hemisphere yet. I am sailing as close to the wind as possible, and still can't make a course directly for Sri Lanka. I can only hope the wind changes direction well before I get there. Take Two is sailing farther off the wind, therefore faster, but they will have more lateral course error to make up later. The Inter tropical Convergence Zone is the place where the Northern and Southern winds collide. It is near, but not necessarily on, the equator. The wind in the "zone" is variable in direction and velocity, sometimes there's just none — that's called the "doldrums" and was the great fear of old-time sailors, who sometimes drifted for weeks. And there are plenty of squalls and thunderstorms, since it's usually very hot and winds are often light — perfect conditions for a thunderstorm. The air is clearer here than in the Pacific, which makes the sunsets spectacular. I think the Pacific haze comes from the Americas — long-range pollution from the U.S., Mexico, and Brazil, where they are burning the rain forests. Sometimes a volcanic eruption produces a global reduction in air quality and visibility — when Mount Krakatoa in Indonesia blew up in 1883, temperatures in Europe were abnormally low the following few winters (the Thames river froze) and sunsets were oddly colored around the world. Some days here the sun makes it all the way to the horizon without being obscured by a cloud or haze. So I have resumed my quest for the "Green flash." Supposedly the moment the upper limb of the sun passes through the horizon you sometimes see a green flash. I haven't seen one for sure, but twice I think I may have seen it — once in Hawaii and once here in the Indian Ocean, but on both occasions it was not a dramatic green color, so I am waiting for a more conclusive example before I decide it's real. I have a theory about it — it's actually a green "afterimage" produced by one's eyes, caused by watching the red sun until it disappears into the horizon, leaving one with the complementary color of green or "un-red." But green flash or not, sunsets are spectacular here. Usually there are some cloud buildups by late afternoon, which (apart from how much trouble they cause me) are transformed from dull cumulus lumps at 4 PM into ingeniously colored fairy castles, complete with pennants flying from each balustrade and tower, by 6. And one look isn't enough, and one direction isn't either. You must occasionally look in the opposite direction from the sunset, see pinks and reds in the region just vacated by the sun, then scan the horizon to your own sunset. I have given up trying to capture these afternoon episodes on film — the results never approach the actual event, and the camera distracts me anyway. I miss too much while trying to decide when to press the shutter. I have been thinking lately about my experience of sailing, in particular how it has changed. When I made my crossing from Brookings to Hawaii, I was more alone than ever in my life. I could have yelled my head off or danced naked on deck — I could have fallen off the boat and no one would ever find out what happened. Completely alone, completely self-dependent. All that is still true, but in the months since then I have come to feel in touch with the world in spite of the distance. I talk to Bob and Ursula on the radio every day — we share experiences and views. I tune in the B.B.C. and hear the latest world events. I still enjoy the solo sailor's self-dependence and aloneness, but part of me isn't having any of that, and that part builds connections through ritual. Writing letters while underway. Listening to the B.B.C. as if the events they describe could have any significance to me, sailing here on the Indian Ocean between two places each about 700 miles away. Watching a sunset, thinking I'll tell someone about it, next chance I get. I am also thinking about my halfway point — the "Antipode," the point opposite my starting place. Fifty-eight degrees East longitude is opposite my home in Oregon, but I'm going back to Hawaii before returning to the West Coast (it's easier that way), so 25 degrees East is the other antipode, perhaps the "real" one. Besides, if I think of it that way I can have two silly milestones to notice as I sail. On my route, 58 degrees is in the Arabian Sea between Sri Lanka and the Red Sea, and 25 degrees will be smack in the middle of the Mediterranean. After I pass my antipode, all my sailing will have the effect of bringing me closer to home. November 25 — Notes on Sri Lanka: Formerly named "Ceylon," Sri Lanka looks like a tear falling from the Indian subcontinent. 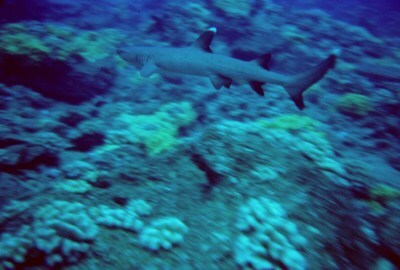 Not only is it not like anything in the Pacific, it is unlike anything I have ever experienced. It is so densely populated that only the basic good nature of the people prevents utter chaos. Notwithstanding that good nature, a civil war is going on, mostly in the Northeastern provinces. A minority group, the Tamils, occupy the lowest rung in Sri Lankan society. They are dominated by the Sinhalese, who own most of the businesses and hold most governmental positions. In a separatist drive, Tamil rebel groups attack symbols of authority such as police stations, post offices, and any officials so unlucky as to cross their path. Sinhalese rebel groups also exist, they attack the Tamils and/or the designated authorities. Two days before I arrived the government forces located and killed a key rebel leader, Mr. Rohana Wijeweera of the JVP (Sinhalese People's Liberation Front), and several others in their hideout. Accounts of the event vary — in one account Wijeweera gave himself up and offered to take the government forces to the hideout, and as they approached it one of his lieutenants opened fire, precipitating a firefight that resulted in the death of all rebels present. The local B.B.C. correspondent described this version of the events as "implausible." Other accounts have been offered, but the single incontrovertible element in all the accounts is that Wijeweera's body was cremated by the government immediately after death, without examination. This setback for the rebels does not seem to have reduced the level of violence. Attacks on buildings and individuals continue to be reported, police stations being the favorite target. Contingents of the Indian Army have been on the scene for some time, originally at the invitation of the Sri Lankan government, but they are now being asked to submit a timetable for their departure. Apparently they turned out to be sympathetic to the Tamils and their presence has not had the intended effect of reducing the level of violence. In fact, occasionally a story appears in the local press in which a Tamil group is found to be armed with Indian weapons. It's educational to read accounts of the conflict in the local press. I can only conclude that strict controls have been placed on the way news is reported — for example, after some days of confusion about her whereabouts, Wijeweera's widow is described as placing herself "in the protection of the government forces." Lengthy newspaper accounts describe how Mr. Wijeweera was led astray by dogma, choosing a path of violent change and bringing shame to his family. The rebel forces are by no means united. Accounts of division between them are, naturally, reported at length. In a recent story the LTTE (Liberation Tigers of Tamil Eelam) accuse the TNA (Tamil National Army) of being lackeys of, and supplied by, the Indian Army. This accusation could scarcely have escaped the attention of the government, since it simultaneously indicates division among Tamil rebel groups and misbehavior by the Indian Army. One need only travel by road to discover that wartime conditions exist. 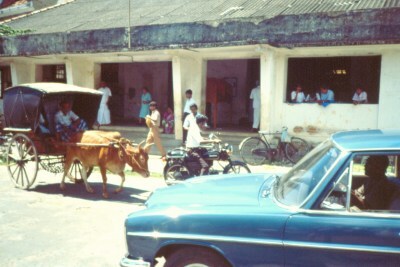 Roadblocks halt traffic several times between Galle and Colombo, and occupants of vehicles are individually searched. People in the employ of the government travel with several bodyguards. The status of a soldier is instantly obvious from his armament — while a rural policeman may be armed with an ancient and worn Lee-Enfield from colonial days, a member of an elite unit of the Sri Lankan Army proudly bears a new Soviet AK-47 that looks as though it has just been unpacked. But no one who wears a uniform, or has governmental responsibility, travels unarmed. Apart from the fact of the war, travel by road can only be described as terrifying. The roadway is about 1 1/2 times the width of a single vehicle, so when two vehicles pass, they must throw themselves against the sides of the roadway in such a way as to swing past one another by centrifugal force. This maneuver requires substantial speed, for to slow down is to invite disaster. From time to time a truck smashes into a building in attempting this maneuver, and one can see several pulverized buildings on the roadway between Galle and Colombo. The range of vehicles and velocities is astounding. From pedestrians, ox-carts and elephants through bicycles all the way to huge trucks, each seems intent on passing all obstacles on both sides, on a smoky, rainy, darkening roadway. I have yet to see a dog make an aggressive move toward a car, in fact dogs here have a profoundly haunted look, as if they don't expect to live beyond their own short-term recall. And they seem especially nervous when passing a restaurant. The level of poverty here is extraordinary, in my limited experience of such things. This was brought home to me the first day, when I saw local people queued up near the dumpster used by the yachts, taking turns going through the garbage. At the end of the day the dumpster was empty. 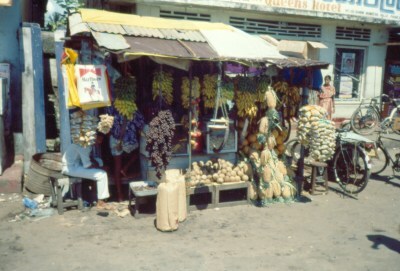 A visit to the town marketplace is a quick education. It is more than just an open-air mall filled with struggling mortals — it is a world that operates on different principles. You may stand and slowly examine the pineapples if you wish, but you are likely to find yourself in the converging paths of an ox-cart going West and a three-wheeled motor ricksha going East. I see people moving themselves and their wares in an amazing variety of ways. Balanced on the crown of the head. Pulled by an ox, who, even though surrounded by a fantastic amount of motion and noise, seems nearly asleep. Propelled by a lawn-mower attached to a converted ox-cart. A bicycle caught my eye — it was a complete fish market, with several kinds of fresh fish, a scale, and a proprietor who also pedals. It is no accident that the Sinhalese are the merchants. Their methods range from the ingenious to the criminal, although the latter perhaps not by local standards. If someone offers to help you find a particular shop, you will pay about 30% more when you get there because the shopkeeper must pay your "guide" that amount after the purchase. Sometimes when you enter a shop you discover you are the center of an entourage of five, all of whom try to impress the shopkeeper with their relevance to your entry. The range of individual well-being makes an American marketplace seem sterile. From the most prosperous shopkeeper, sipping tea between visits by well-heeled customers, to a legless man who, with neither wheelchair nor wheeled cart, must drag himself about with his still-functioning arms. At noon each day this man crosses the street from the morning to the afternoon shadows. When he makes his way across, the traffic doesn't stop, instead it parts. Big trucks, smoky buses, rickshas, ox-carts, bicycles, pedestrians, all make the smallest possible course corrections necessary to miss him. I think it took him about two minutes to cross the ten meters of road, but to me it seemed an hour. This marketplace is an organism that thrives by its own rules, and the rules are complicated. I leaned over the counter of an open-air electronics shop, surrounded by heat and noise, and asked "Do you have a watch like this? It has five alarms." The proprietor looked up from his newspaper. He glanced at my watch and then at me. A small smile. "Buy five watches." December 24 — The political situation has deteriorated somewhat. The government's confidence after the capture and killing of Wijeweera has evaporated as the result of a new round of late-night violence. Here in the South most of the fighting is between factions of the JVP and pro-government vigilante groups. To cover their tracks, the rebels burn the bodies of those who are killed in the fighting, usually on a stack of automobile tires. The rebels recently blew up the power lines, so there is no electricity or water pressure in Galle. In the anchorage we are rationing our water, collecting rainwater with awnings and buckets, and the bay is too polluted for swimming. I plan to raise anchor about January 5, good timing for the Red Sea.